Far to Go by Alison Pick absorbed me fully—smoothly pulling me further and further into its midst. I didn’t want to stop reading and I absorbed the book in less than a week (quite the feat as it was during term paper time). It is no surprise Far to Go was shortlisted for the Man Booker Prize and won the Helen & Stan Vine Jewish Book Award. Yes, it takes place during the Holocaust, but it doesn’t leave you as depressed about humanity as other WWII fiction can. In 1939, Pavel and Anneliese Bauer are secular Jews whose lives are turned upside down by the arrival of Hitler. They are unable to leave the country in time to avoid deportation, but they do manage to get their six-year-old son Pepik a place on a Kindertransport. Meanwhile, a fascinating and compelling present-day strand in the story slowly reveals the unexpected fates of each of the Bauers. Through a series of surprising twists, Pick leads us to ask: What does it mean to cling to identity in the face of persecution? And what are the consequences if you attempt to change your identity? Inspired by the harrowing five-year journey Alison Pick’s own grandparents embarked upon from their native Czechoslovakia to Canada during the Second World War, Far to Go is an epic historical novel that traces one family’s journey through these tumultuous and traumatic events. A layered, beautifully written, moving, and suspenseful story by one of our rising literary stars. Instead of focusing on the ideological issues or historical issues affecting the characters, Alison Pick delves into their heart and soul. The Bauers are people simply trying to navigate the choppy political waters of Czechoslovakia during the Second World War. Mr. Bauer does what he thinks is best for his family, but as the reader is informed straight from the get-go, Mr. and Mrs. Bauer do not survive. The stories blur the chronological landscape, with events from 1939 and events from present day, intermixed with faux historical records. I love reading historical fiction because of the smidgen of truth burrowed away within. What was even more enticing was the fact that Pick was researching her own family’s history as Jews in Czechoslovakia during WWII. The first page of the book (I read the hardcover edition) has a list of names including Bauer, Pick, and dates. As you begin reading the present day story, you’re unsure whether this is more of a memoir, when you’re quite sure it was marketed as fiction. We slowly discover the present day is narrated by an old woman named Lisa, whose dedication to researching the Czechoslovakian Jews deported by Hitler has led to a lonely life. Interspersed are letters to and from Mr. and Mrs. Bauer, all ending with the filing information and the words “died in Auschwitz, 1944”. Thus begins our tale—narrated mostly from Martha’s point of view, as governess to little Pepik Bauer. Pick weaves an incredible tale wrought with uncertainty, fear, despair, but above all, love. The love these characters bear for one another, each in their own strange and sometimes unconventional ways, is an interesting case study into humanity. What made these people behave this way? Why didn’t they get out while they could? Yet how could they have known the terror waiting in store? How did it feel to be alienated from your home? What does lack of identity or personal history do to a person? All these questions were running around my brain once I put down the novel. I very nearly picked it up again to reread. Our past has an influence on our future, and as humans we experience a tension when exposed to placelessness. Even though some people would argue the Holocaust has been over-written, especially in historical fiction, I would argue that (as with any genre/style/subject) it really depends on the point of view. The angle that Far to Go approaches the Second World War, as simply the setting for the issues and tribulations fared, sets it apart. In addition, telling the story from a Czechoslovakian perspective adds a certain element to the writing with the inclusion of Czech phrases and words that aren’t instantly defined for the reader. 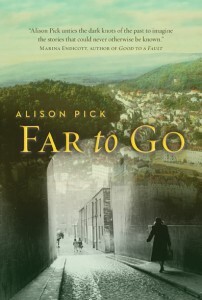 Far to Go by Alison Pick is an incredible novel, beautiful story, and well-written. It definitely makes the list of best books I’ve read this year and I cannot wait to recommend it to friends and family.